Aquavit is a distilled liquor, like vodka, but aquavit’s distinctive aromas and seasonings come from a blend of herbal essences of fennel, caraway, and anise, which are the classic aquavit spices. O.P. Anderson “Original” Aquavit is made from Swedish wheat and distilled with spices; in addition, the finished distillate rests in oak barrels for six months in order to mellow. Eminently versatile, at 40% alcohol O.P. Anderson Aquavit may be enjoyed neat and chilled, paired with smoked fish and other Nordic cuisine, as a savory alternative in classic cocktails such the Bloody Mary and Last Word, or as a base for new drink creations. Thanks to the distillery’s exceptional quality standards, O.P. Anderson Aquavit has won numerous awards as well as several gold medals in the prestigious International Wine and Spirits Competition. O.P. 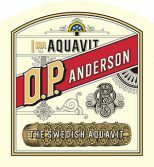 Anderson “Original” Aquavit is the best-selling aquavit in Sweden and, today, the world over it is traditionally served as an aperitif, while bartenders and consumers are increasingly enjoying its herbal flavorings in all types of innovative drinks. Add the ingredients to shaker and fill with ice. Shake gently and strain into highball glass with fresh ice. Garnish with a celery stalk and a lime wedge. Add all ingredients to a shaker and fill with ice. Shake, and double-strain into a chilled cocktail glass.